CINCINNATI, OH – APRIL 21, 2017 Stop Stick®, the tire deflation device from Stop Stick, Ltd., has honored Llano County Sheriff’s Office Deputy Bucky Boswell with its “Hit of the Year” for 2016. The Hit of the Year and the Hit of the Month program recognizes the outstanding deployment and use of the Stop Stick Tire Deflation Device in ending a pursuit. In March 2016, Boswell successfully deployed Stop Sticks to apprehend an elderly man who had assaulted and attempted to run over his wife. The pursuit began in Buchanan Dam when the suspect, confronted by a deputy, fled the scene. The pursuit reached speeds of up to 110 miles per hour and extended 15 miles as the suspect drove into oncoming traffic and forced other drivers off the road, according to Boswell. “I set up by the guard rails approximately two miles from the City of Llano and the busiest intersection in the county,” Boswell said. “The suspect was driving 100 miles per hour when he hit my Stop Sticks.” With the help of the Stop Stick, the chase was ended safely about a mile from the intersection. Hugh Campbell, a national sales director for Stop Stick, said Boswell received the award not just for a successful stop, but particularly for stopping the vehicle in a safe way. “By deploying Stop Sticks, Deputy Boswell was able to stop a dangerous individual, who reached speeds of over 100 mph, by flattening his front tires,” Campbell said. “Not only did Deputy Boswell end the chase, but he also protected himself by using a guardrail.” Campbell said Stop Stick received more than 1,500 pursuit reports nationwide in 2016. Stop Sticks are stored in strategic locations throughout Texas’ Llano County, to provide easy and efficient access to law enforcement officials, according to the Sherriff’s Department. 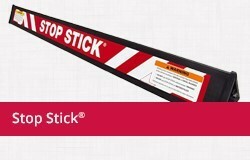 The Stop Stick weighs about four pounds and can be thrown onto the road or another area with an attached cord reel. 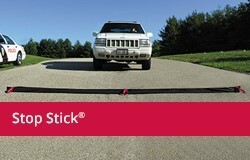 After use, the Stop Stick is quickly removed from the road by pulling the cord. 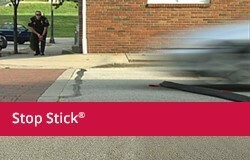 In the last 20 years, law enforcement officers have successfully ended more than 25,000 vehicle pursuits in the U.S. and abroad using Stop Stick devices. 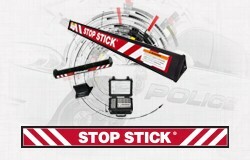 For more information on Stop Stick and other products available to assist law enforcement in protecting the public, please contact Stop Stick, Ltd. at 800-537-01012 or email . 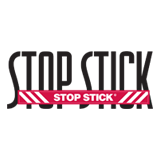 January 29, 2019 Stop Stick® Stops Two-for-one!